Today, I'm revealing what I received in the Foodie Penpal program that The Lean Green Bean offers. My penpal was Karen over at Eat Right. Live Right. RunWright. I told her that I'm gluten-free/Paleo and like minimally processed food items. She definitely chose some great things that fit my foodie requests! NibMor Drinking Chocolate - mint flavored, gluten, sugar and dairy free, as well as non-GMO - It sounds soo yummy! Mamma Chia Squeeze Blackberry Bliss - non-GMO and organic - I haven't tried this yet, but am looking forward to it! I've actually never had chia seeds. Twinings of London Teas - Green Tea Camomile, Camomile, Honey and Vanilla, and Black Tea Orange Bliss - I love tea, so I can't wait to try these, especially that Camomile, Honey and Vanilla flavor. Theo Dark Chocolate Orange bar - organic, non-GMO, and fair trade - This is delicious too! This was the second thing I tried, and as Karen said in her lovely note, "a lady can NEVER have too much chocolate." Goya Sazon Seasoning Pack - I've never tried this seasoning, and Karen mentioned it is popular in the Caribbean, where she is from. I love trying new spices and flavors! Dried Mango Slices - organic - I've never tried dried mango slices, but they look delicious. Karen says it's one of her favorite fruits. I'm so glad I participated in the Foodie Penpals. It was such a fun experience and I received several things I've never tried before. Karen was very thoughtful in all of her selections for me! I'll definitely be signing up again. If you want to sign up for the next round of the Foodie Penpals, click here. That chocolate with raspberries is awesome. It really was my favorite thing to get you and it was the first item I settled on. Glad you like the Foodie Penpals. Hope you consider doing Running Mates fitness penpals with me too. I'm all about making and linking up new friends. More info on my blog about it. So cool! Sounds like some awesome goodies! What a neat concept! I have a feeling that my package would include a lot of candy and beef jerky... Eeek lol! How fun! Oh man I put chia seeds in my smoothie EVERY morning! They're great. And I've never had dried mango before either. Sounds fun! I'll check it out! I recognized a few products from Trader Joe’s, and I love shopping at TJ’s! 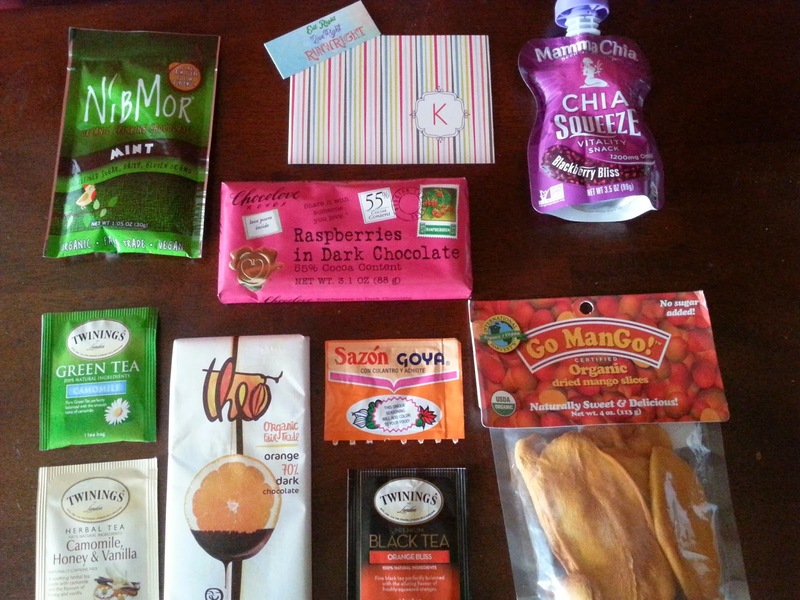 What a fun way to exchange delicious goodies!